I LIKE trying for the "best" from what I have spent! I'm not into buying crappy kits "on purpose" just for the sake of building something "cheaply", specially not if I can get better... more joy - per - buck if I get more kit for that buck! But that's just me! Other's mileage will differ. Let's see some good builds done cheaply! I have to agree with Bob. I LIKE trying for the "best" from what I have spent! I'm not into buying crappy kits "on purpose" just for the sake of building something "cheaply", specially not if I can get better... more joy - per - buck if I get more kit for that buck! I thought I was safe with the Heller Somua, but as it seems Tamiya will jump in here aswell. I think I have to take the "now or never" chance, luckily the kit and Eduard PE are within the my own 20 Buck limit. hobby boss do a set for the Hotchkiss, they look pretty similar. Yeah... I have THAT old dog, too! And, NO, I didn't buy it - back in 1972, I think... - "to expressly buy a crappy kit". It was the ONLY styrene Somua kit in town, and NOT cheap, either! I STILL haven't had the stones to actually pull it out and try to make it work! It's a shelf-queen right in its box - a momento-mori of a long-gone past. Now-a-days, I am MUCH more particular about the kits I buy, knowing as I do that I'll never get to build most of what I already have, let alone of what is out there to be bought! No more "purposeful acquisitions of real dogs for me!" I'm waiting to see what Tamiya does with it, but boy, am I hopeful for Good News on it! We NEED a good Somua kit! But I am really unsure that the Hotchkiss set could work in there - it is similar to the Renault R-35 tracks, but I don't know about that Somua. I have built one of those(reboxed by Trumpeter). It was a fun build, even if it is not accurate. I must have bought it in the last two years from an other modeller, he sold me some other kits aswell I wasn´t that hard to add another 10 bucks for this kit. It was still the only Somua on the market... But as I leared with quite a few other kits, waiting for a new state to the art kit is sometimes faster than building an old dog. I actually have equipped the Heller R35 with those HobbyBoss tracks, which are made for the H39. They are a bit wrong for the R35, but completely wrong for the S35. As the Somua is slightly longer you´d most probably need two of these sets aswell, from my experience (H39 & Cromwell) there aren´t that many extra links in those packs. 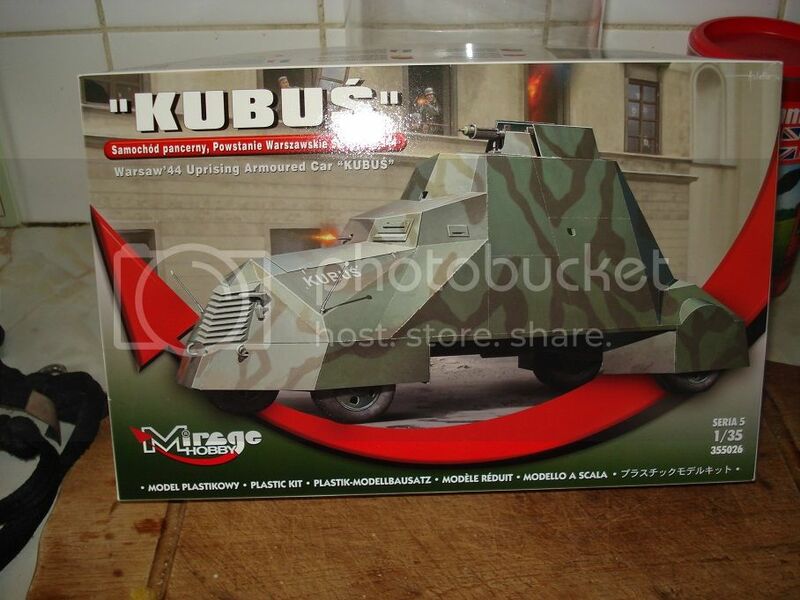 I could buy the the Friuls (ATL-67) but tossing another 30€ on a 10€ kit desn´t make too much sense to me, even without the Tamiya kit in sight. But anyway, I guess there will be more options with the Tamiya kit in the shelves, if it´s just taking the rubber tracks from Tamiya to upgrade it with something else. I need some advice here. I managed to pick up an Airfix Forward Assault Group kit, which contains a Supacat Jackal for £8.99 and some PE for the Jackal for £9.99 both direct from Airfix. I know I am under the £20 mark but the question is, "Does the Jackal count as the right type of build for this campaign?". "Does the Jackal count as the right type of build for this campaign?". 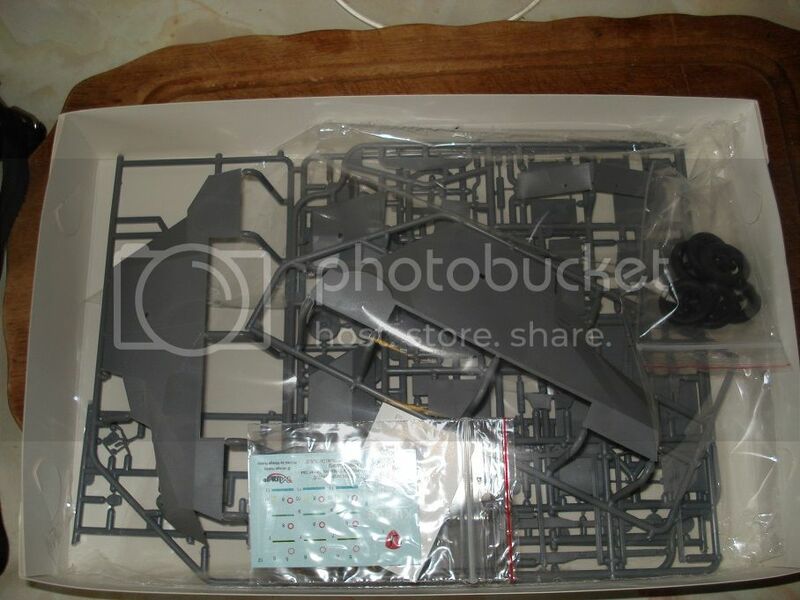 It´s the 1:48 kit, right? So you´re within the scale range and under the price limit... abslutely no problem here. There is no right or wrong here, as long as your kit qualifies. It is the 1/48 bur was not sure it qualified as a true AFV which the campaign sits in. I will look forward to taking part. I'm in. Decided to do my first campaign as an oddball since I needed to fill my cart with something. So I'm doing a Chinese Type 83 SPG with a PE detail set for $22. We'll see how I do at this armor thing given I've built aircraft most of my life. Removed by original poster on 02/06/15 - 06:47:11 (GMT). I think Eric nailed it: "I say $25 covers it all up to the paint, simple. What ever deal you can score for that is what you go with"
Whatever kit you can find for less than 25$, 20€, 20£ or a simmilar ammount of your favourite currency, can take part. All your paints and weathering solutions can be used, without calculating them in. Well Guy's it's definatly the 20th here so I'm going to make a start on my entry. 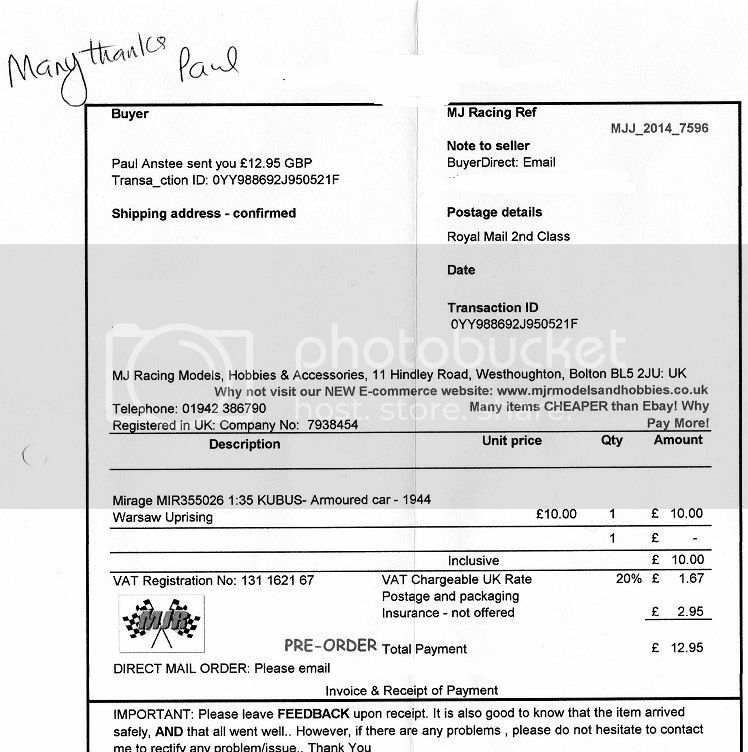 Just for a laugh here is the proof of what the kit cost! I don't think it'll take that long to build but adding all the welds will! I've just used the Archer resin transfer weld lines. They'd be very good for those long flat welds but cost-wise may take you over the limit. I have a pack I bought when they first came out no-idea what I paid though! Stretched sprue might do, never tried it so maybe I'll try using my pyro tool as they cast most of them, as plain bar on the kit! The worst missing one is the one that should be around the rear armoured pieces covering the rear wheels. Nice big semi-circular welds completely missed off, very wide and rough, maybe I'll do that one in filler. The other intresting thing will be the paint job. Period pics being b/w make the cammo colours hard to read. Reference of the real one in Poland and the repro one in another Polish museum show the same style of cammo but in different colours! One is grey with brown stripes and the other(the repro I think) is light grey with a darker grey stripe as is also the illustration on the Toro models 1/72nd resin version. I'm already in the expensive project (Going Whole Hog!! Campaign). Taking a part in this project could be a healthy counterbalance. Fabian, I've a doubt about my kit. I'm not quite sure if it will stick to the rules. 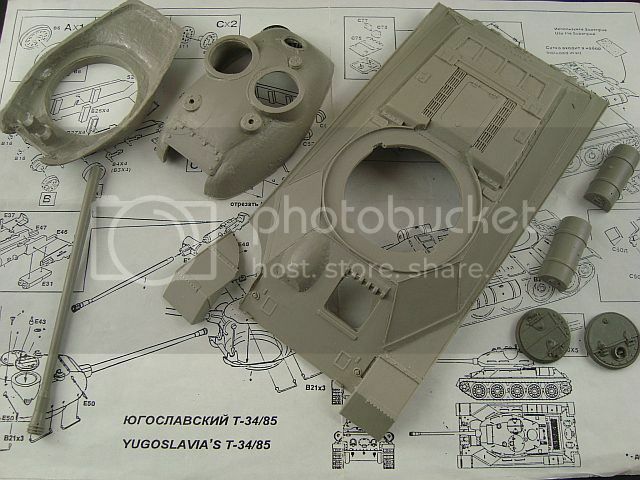 Few years ago I've bought on eBay an incomplete (and partly broken) set of Yugoslavian T-34 Vozilo A.
I'm pretty sure that it cost me less than 20$. Otherwise I wouldn't buy it. 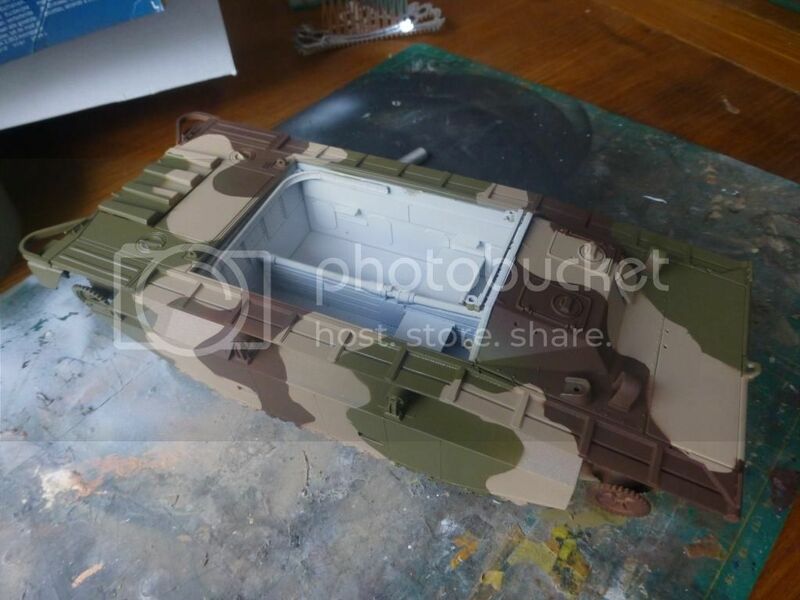 To finish this tank, I would use lower hull and a whole suspension from DML T-34/85 (6810 Chinese volunteer). Is it OK for this campaign, or it sounds to expensive? My 1970's Tamiya Chieftain still in the plastic. Tonight Its drink beer, turn up the tunes, cut and glue vintage styrene! I´m tempted to allow it, hope that´s ok for everyone. Looking forward to your build then. @Eric: Have you tried fixing it with another beer? I thought that the campaign rules said that the kit and other accessories need only be bought for less than the equalivant of $25 USD or whatever the amount in other currencies. If he had bought it for less than $25 in his native currency, I don't see why it can't be included? If the spares cane with the kit or if it's coming out if his spares box, then that would be fine, wouldn't it? Absolutely, the problem is (if I got that right) the conversion kit was less then 20USD, not including the Dragon kit. Litterally using half of another kit, is a bit more than a "some spares"... hence the Dragon kit should have been calculated in the entire expenses. But how much of it? As I sated somewhere before, if you´re not aware of the price you bought it, you can go with current market value. In this case, a kit with simmilar to Dragon Imperial "quality", partially started, almost 20 years old... which (on a scecond thought) can´t be that much, although can be still blow the budged. As Marek said, "the boundaries of this project are soft", especially in such cases. If you read my first statement, I hope I made clear that I haven´t banned it from taking part, just expressed my reservations. @Marek: It would be perfectly fine to me, if you´d choose to enter with your strange T-34... Actually I´d like to see it beeing build. How about you use the left over hull and turret and surprise us with a second T-34 sunken in mud? Something like that? My entry for 20 bucks for £20 campaign. I got this from amazon for £9, still have £11 to spend. 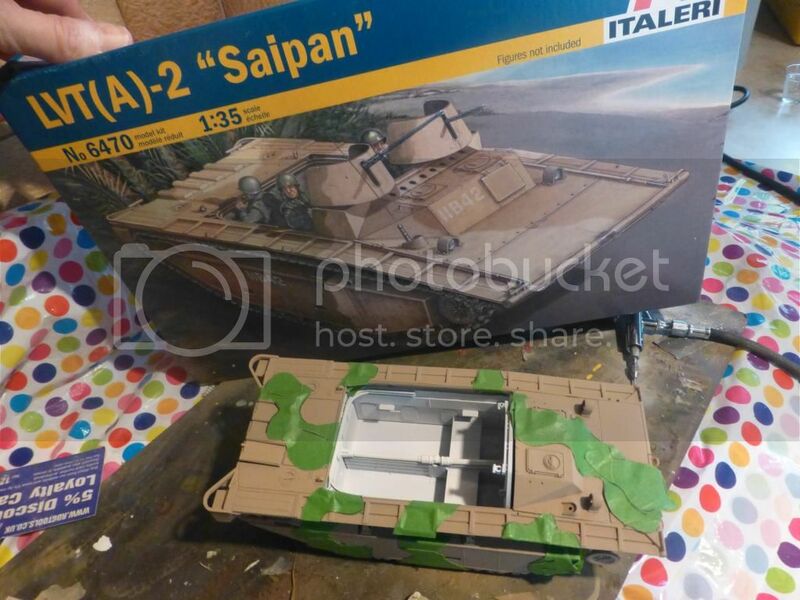 This is the 1/35 Italeri LVT (2) Saipan. Very easy kit to put together, the only slight difficulty is putting the wheels and sprocket together. Gary, that looks awesome so far. 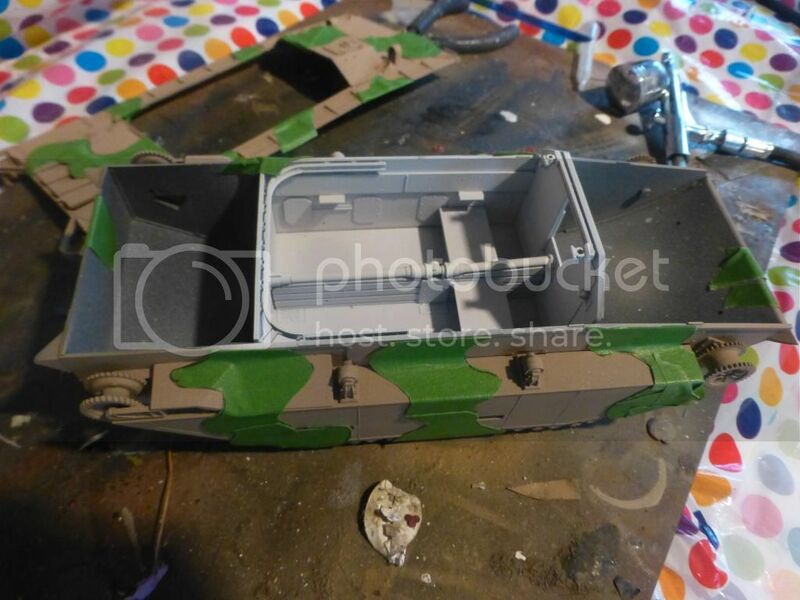 I managed to get some solid time in on the Chieftain, I finished the construction and scratched my head, 16 steps and you've got a chunk of plastic in the rough shape of a tank. I did make a mantlet cover out of apoxie sculpt as it just looked far too empty as it was. Time for a shot of primer!